Eric Ebron is the top tight available for the 2014 NFL Draft. The 2014 NFL Combine is now in the books. We will give recaps of the players that made money by improving their draft stock. Today we continue with day one of the Combine when the offensive line and tight ends were on display. Today’s focus will be on the tight ends. This year’s crop of tight ends was touted to be very talented, however, none of them really stood out during their Combine work outs. Some of the more athletic tight ends did not run as fast as expected and many of them had multiple drops during the drills. Jace Amaro – Texas Tech – (6-6 265 lbs. ): Not an inline blocking tight end. Played as more of a slot receiver for the Red Raiders. Looked stiff running pass patterns. Had some drops. Does a good job adjusting to the ball in the air. Ran a disappointing 4.74 40 yard dash (5th best TE). 33” vertical (5th best TE) and 9’10” broad jump (5th best TE). Had a disappointing day for someone who was highly regarded coming into the Combine. Trey Burton – Florida – (6-2 224 lbs. ): Did a bit of everything for the Gators, playing quarterback, running back and tight end. Very athletic. Due to his thin frame, he will have to play from the slot. Ran 4.62 40 yard dash (4th best TE), had a 7.14 3 cone (tied for 2nd best TE) and 4.32 short shuttle (5th best TE). 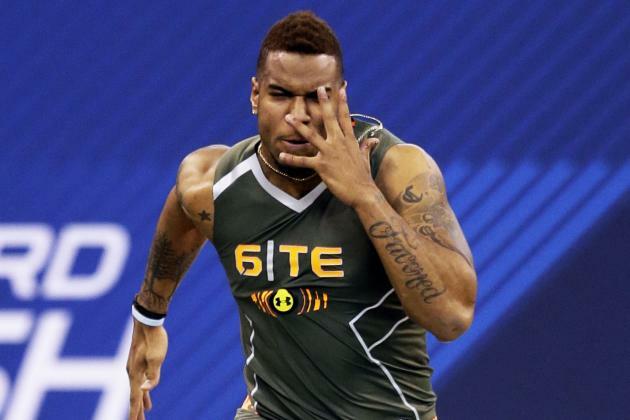 Eric Ebron – North Carolina – (6-4 250 lbs. ): Came in as the highest ranked tight end and he did nothing to change that. Has good speed and natural hands. Had 24 bench press reps (6th best TE), a 10’ broad jump (tied for 3rd best TE) and ran a 4.60 40 yard dash (2nd fastest TE). C.J. Fiedorowicz – Iowa – (6-5 265 lbs. ): Good inline blocker. Does better on short to intermediate routes. Struggles a bit on deep patterns. Has big hands and a large catch radius. Good lower body flexibility. Had 25 bench press reps (5th best TE) and ran a 7.10 3 cone (fastest TE) and 4.26 short shuttle (fastest TE). Crockett Gillmore – Colorado State – (6-6 260 lbs. ): Doesn’t blow you away with measurables, but looked fluid during on field drills. Good combination of blocking and receiving skills. Runs good routes and has good hands. Good lower body explosion. Had a 33.5 vertical jump (4th best TE) and 10’ broad jump (tied for 3rd best TE). A.C. Leonard – Tennessee State – (6-2 252 lbs. ): Fasted tight end at the combine, running a 4.50 40. Looked smooth during the drills and ran good routes. Soft hands. Will likely be a slot or a motion tight end due to his height. Good lower body explosion. Had a 34” vertical jump (3rd best TE) and a 10’8” broad jump (tied for best TE). Colt Lyerla – Oregon – (6-4 242 lbs. ): Extremely athletic, but has character red flags after being dismissed from the team. Runs fluid routes. Had some drops on the drills. An emotional player that can let his emotions get the best of him and hurt his team. Ran a disappointing 4.61 40 yard dash (3rd best TE). Had a 39” vertical (best TE) and a 10’8” broad jump (tied for best TE). This entry was posted on March 5, 2014 by draftmaniacs in All-Star Games and Combine and tagged 2014 NFL draft, A.C. Leonard, Colt Lyerla, Eric Ebron, jace amaro, NFL, NFL Draft.